The Indigenous people of Biafra (IPOB) has raised alarm with grave concerns for arrested Biafran women who were protesting for the release of their leader Nnamdi Kanu, The Nigerian Police used tear gas to disperse the protests last Friday in Owerri Municipal, whisked away hundreds of Biafran women to the state CID and allegedly collected their cell phones and personal belongings. 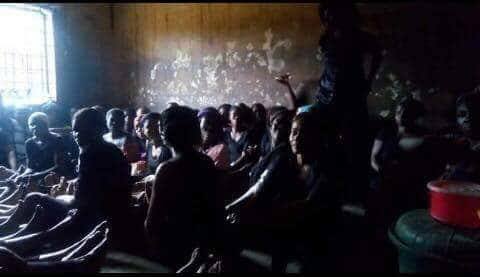 A report has it that they are being detained and tortured lawlessly by the Nigerian police, about 44 IPOB Biafran Women jam-packed in a 12by 16 ft room after their abduction and are being held by Imo State CID against their fundamental human rights for peaceful protesting in Owerri, said an IPOB principal officer. Also, information gathered this morning from a witness who pleaded anonymity for security reason said this morning at around 4am some of the women who were found with Biafra materials are being secretly moved to an unknown location where he claimed they will be mercilessly tortured and maltreated for State disturbances urged the group to alert the public concerning this new development which he said is very alarming. IPOB has called on the attention of the International community towards this grave human rights abuse, saying Biafran women reserve the right to free speech and expression, in a new press release the group issued a warning to the federal government on a planned "Operation Python Dance III in the South East, a similar exercise last year that left many of its members dead. The group warned the Nigerian Military not to embark on the planned exercise. Meanwhile, Nigeria President Muhammadu Buhari has come under fire and is being sued by a U.S based lawyer Bruce Fein at the International Criminal Court of Justice (ICC) on massive accounts of human rights abuses, Buhari who is currently on a sick leave in the United Kingdom visited the ICC last month and gave a controversial speech on human rights abuses in Africa, has been largely criticised both home and abroad, concerned citizens of Nigeria have labelled him a "Sick Dictator" and unfit to govern the country, therefore, calling for his resignation following series of attacks and brutal killings by the Fulani herdsmen on local communities that have left thousands dead since he took over office in 2015.